Calendar – September 24, Affordable (Health) Care Act ; Candidates meetings – October 4, 15, and 18. Morgantown Membership Meeting with Natalie Tennant and Jeff Kessler! The Fall Membership Meeting for the League of Women Voters of Morgantown-Monongalia County will be held Wednesday, September 19, 7-9 p.m. at the Aull Center (Historic Garlow House) 351 Spruce Street. This meeting is open to the public. Our special guests will be Natalie Tennant, WV Secretary of State, and Senate President Jeffrey Kessler. They will be speaking about voter ID issues in WV, and legislation concerning voter ID. The LWV has always tried to lower barriers to participation in government, but voter ID rules in other states can be cumbersome and intimidating. We welcome the opportunity to hear current views about this topic. Information about the League will also be presented, and there will be refreshments at the end of the meeting. As always, we encourage others to join the League. We have a new introductory membership fee just for this fall – individual $22, household $33 – good for one year. Candidates and incumbents from all parties running for office in West Virginia will speak for 3-5 minutes to introduce themselves and their platform to the students. October 11, 6:30-8:30. Political parties will be present seeking volunterrs to help with campaigns and suggestions for how students can participate in the democratic process. The League of Women Voters will also be on hand registering students to vote and explaining the electoral process. The LWV of Wood County’s September 24 meeting will concern the Jobs for West Virginia’s Graduates, a high-school dropout prevention program already serving at-risk students in Greenbrier County. Advocates hope to bring it to Wood County. September 24, 7 pm at the Vienna Public Library located one block west of Grand Central Avenue on 23rd St. in Vienna. The LWV of West Virginia’s Voters Guide for candidates for statewide office in the 2012 General Election will be posted on or about October 10. Please check back then to learn about the candidates. a.. October 16 Last day to register to vote b.. October 24 – November 3 Early Voting Period c.. October 31 Last day to apply for an absentee ballot d.. November 6 GENERAL ELECTION The Secretary of State’s web site (www.sos.wv.gov) has profiles of the candidates for WV Supreme Court of Appeals in the Elections Section. Our Fall Membership Meeting will be held Wednesday, September 19, 7-9 p.m. at the Aull Center (Historic Garlow House) 351 Spruce Street. We will have as our special guest Natalie Tennant (WV Secretary of State) who will be addressing “Voter Issues in West Virginia”. The LWV has always tried to lower barriers to participation in government. At our Annual Meeting in May, guest speaker Stephen Spaulding gave us many examples in which voters were disenfranchised because of restrictive voter requirements or illegal activities such as Robo-calling. Voter ID rules in other states can be cumbersome and intimidating. Are there any Voter ID issues in West Virginia, or instances of voter fraud? 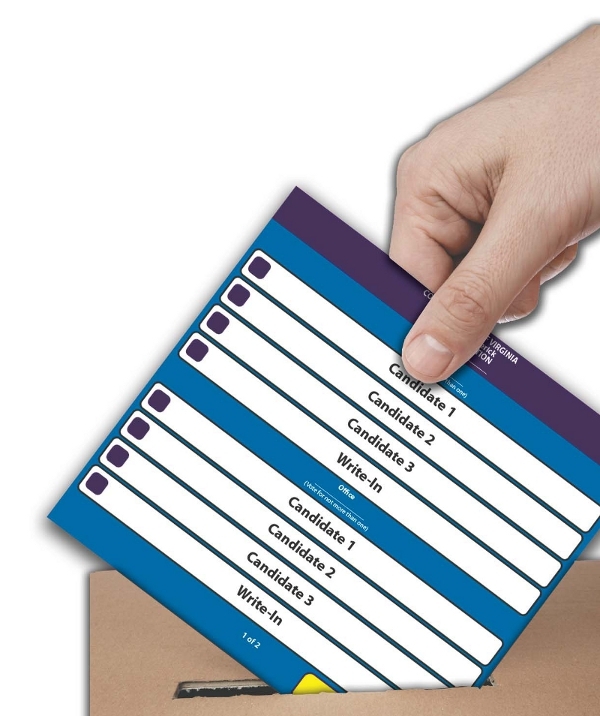 How can we combat misinformation that could discourage citizens from going to the polls? How can our League work to promote voter turnout in the upcoming elections? Natalie Tennant will address these issues at our membership meeting on September 19th. As always, we encourage others to join the League. We have a new introductory membership fee just for this fall – individual $22, household $33 – good for one year. This is a great time to join the League – we will be holding two candidate forums in October, and are looking forward to several interesting discussion meetings for members in November and December. On July 3, 2012, City Council unanimously approved zoning laws to regulate extractive industries within city limits. Many of our recommendations made it into the zoning language to the credit of Natural Resource committee members who diligently worked on crafting them. However, the zoning laws cannot regulate research purposes on WVU properties. During the Legislative July Interim, the Dominion Post reported that “WVU wants to work with an operator to drill a horizontal well on WVU land. It would be a working well, generating money for the operator. But it would also be a research well, with every bit of data from the first turn of dirt through drilling and production and on being shared to advance knowledge in the field.” Collaborating information can be found in the 2012 July Legislative Interim Report discussing the WVU Marcellus Shale Research Center also known as H.B. 4511. General Counsel of WVU, Bill Hutchens, points out that the only thing preventing a gas well was that “Investors for the project had to fold their support after gas prices fell.” Hutchens, the drafter of H.B. 4511 was recorded in the Dominion Post describing this well as the “Dream Project”. We will have to watch developments carefully because the decimating effects of a working well pad on what little remains of green space in Morgantown would be significant and tragic. September 6: State Energy Plan Hearings - This is a public hearing where you may comment on the state’s 5-year energy plan. 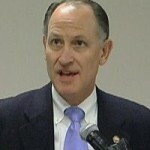 You may comment online, too: See the Natural Resources category at http://lwvwv.org/. A half-day conference on “Wellness and Water: Health Impacts of Fossil Fuel Extraction” will be held this Saturday, Sept. 8 at the First Presbyterian Church, Spruce Street. The keynote speaker is chemist Wilma Subra, who appeared in the film “Gasland.” The morning includes workshops and panels with gas drilling/fracking and MTRimpacted residents. Experts include Dr. Ben Stout, who was in “The Last Mountain” and “Burning the Future,” and Dr. Michael Hendryx, whose research focuses on the extreme human health impacts of mountaintop removal coal mining. Registration begins at 8 a.m., with the keynote at 9 a.m. Closing reception is 1 p.m. A $10 donation is suggested. Info: Robin Blakeman at robin@ohvec.org or 304-522-0246. The conference is sponsored by OVEC, the W.Va. Chapter of the Sierra Club and the West Virginia Highlands Conservancy. Local League member Linda Yoder was a delegate to the LWV National Convention. She reported on her experiences in the LWVWV Voter. Our League was highlighted in a front-page article in the Dominion Post on Sunday, September 2. Also in this newsletter edition, Report on the Annual Meeting, Program 2012-2013. The following article is reprinted with the permission of the Dominion Post and was originally published December 2, 2012. Free babysitting led to nearly a lifetime of political activism for Shirley Rosenbaum. Rosenbaum moved to Morgantown more than 45 years ago as a young mother with two education related degrees. She joined the League of Women Voters to stimulate her mind, after learning that the organization offered free babysitting at daytime meetings. The league is a national, nonpartisan political organization founded in 1920, six months before the 19th Amendment granted women the right to vote. The Morgantown league was formed in 1947 and renamed in the 1970s to include Monongalia County. “As always, our focus is to promote citizen participation in all levels of government and provide information to voters,” former president Lyndell Millechia said in an email. Millechia said many homemakers joined in the 1970s, often because of the free babysitting. Millechia joined early in the “Me” decade, which brought many changes for the league. Members stopped being referred to by their husband’s names, and in 1973, the national charter was altered to open membership to men. Rosenbaum’s son, Jonathan, is one of eight men among the league’s 55 members. But he never hesitated to join because of his gender. 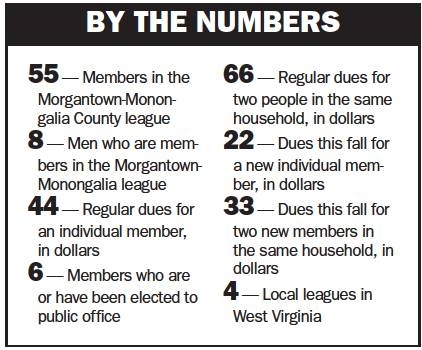 About half of the Morgantown-Monongalia County league’s members are retired. Like Millechia, many women who were active members in their younger years have increased their involvement after retiring. The league’s focus at the national level is to recruit retirees who want to give back to the community. But locally, the league hopes to boost membership by attracting younger members. 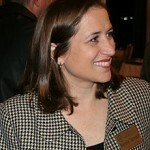 One of the league’s younger members, First Vice President Kelly Palmer, joined after speaking at a 2006 meeting. Past issues addressed by the Morgantown-Monongalia County league include charter revision for the city of Morgantown , comprehensive planning at the county level, land use and solid waste management. Local issues slated for review and discussion in 2012-’13 include the number of county commissioners, Morgantown’s vote-bymail process and legislation related to Marcellus shale gas extraction. “We’re always working on keeping the health of citizens first and foremost when it comes to clean air and water,” Millechia said. 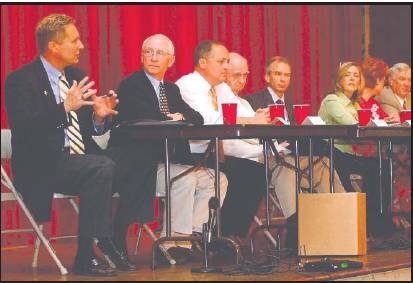 The League of Women Voters frequently hosts forums, in which candidates answer audience members’ questions. The forums are free and open to the public. The league is well known for its nonpartisan candidate forums, held each election year for a variety of races. About 75 people attended a forum leading up to May’s primary election. But members also provide information to voters about candidates and elections, prepare a guide to government officials and host legislative forums. Six members, including Millechia, are or have been elected officials. Many members have also served on local boards and commissions, such as the Monongalia County Solid Waste Authority, Morgantown Library Board and Morgantown Board of Zoning Appeals. “Some people think, ‘If I’m in the league, I can’t run for office’ or ‘I can’t campaign.’ It’s nonpartisan,” Millechia said. If he had to participate in just one community organization, Jonathan Rosenbaum said he would choose the League of Women Voters. Rather than paying their dues and disappearing, most members are actively involved with the organization. “On a per-member basis, the league is many times more effective than much larger organizations I have been involved with,” he said.Right out of the box, the league is about civic engagement skills, it’s part of the culture of the League, and it grows within you. Combine that with the league’s broad based consensus issues platform, and you have a winner. A MEMBERSHIP MEETING open to the public will be held from 7-9 p.m. Sept. 19 at the Aull Center, next to the Morgantown Public Library. 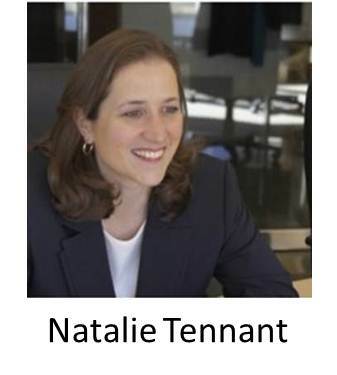 Secretary of State Natalie Tennant will discuss voter ID issues. Refreshments will be served. 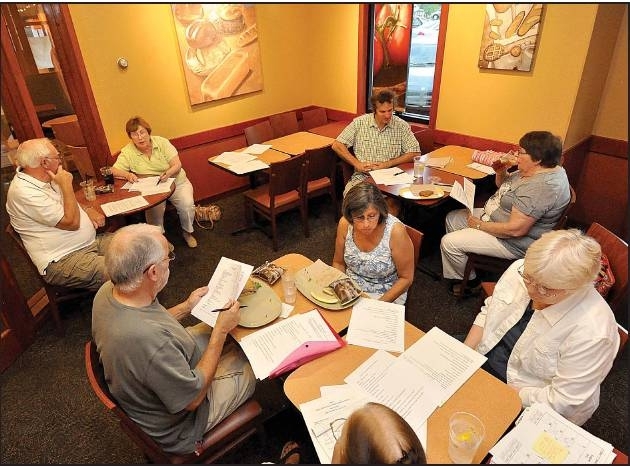 A contingent of members from the League of Women Voters hold a meeting on Aug. 8 at Panera Bread. Frank Ferrell writes a question for City Council candidates at a League of Women Voters forum. 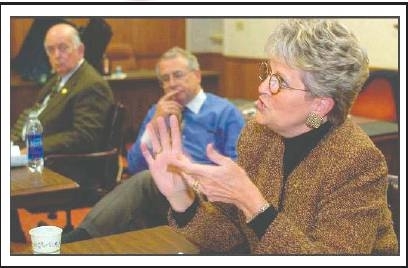 Former W.Va. Secretary of State Betty Ireland (above, right) speaks about changes brought on by electronic voting as former County Clerk Mike Oliverio (left) and Gary Greenhalgh, of Electronic Systems and Software Inc., wait their turn to speak at a forum sponsored by the League of Women Voters. Never in my dreams, in my forty years of passion for the League of Women Voters, did I imagine myself holding up a huge “West Virginia” sign and speaking for sixty brief seconds about the West Virginia League I am proud of. But it happened in June in Washington, DC at the LWVUS convention, and I will be forever grateful to members for sending me as a delegate. I still had so much to learn about the way the League works: makes decisions, apportions its money, chooses issues for study, lobbies on the hill. The way it tries to listen to every voice. The way it is trying to grow the League. The trust in the voter. The vision for the future. I was lucky to be invited by Diana Haskell, our Ruth Shur Fellow who keeps track of activities in West Virginia, to stay in her home in Bethesda, along with a Member at Large from Hampton, Virginia. The three of us talked League morning and evening. Diana’s heart for the League, and the way she devoted her energies to mentoring other members, impressed me deeply. As did her husband’s willingness to drive us into DC early every morning. I found out that caucuses are the way to learn a lot about an issue in a short amount of time, and caucuses sometimes started at 7:30 am or went on to 10:30 pm. I chose caucuses on health care reform, actions in response to the Citizens United decision, and a proposed Department of Peace, for example. I got in on workshops for newcomers to convention, on using social media, and on growing the League. As a coach, I was able to attend a lunch in honor of coaches where we learned to know other coaches and gain a wealth of new ideas. As a delegate, I was able to vote, and one of our proposed studies failed by only THREE votes, proving what we all know, that every vote is important. I got to laugh through the Capitol Steps, listen to Eric Holder let us know how it felt to be under attack, be encouraged by Kathleen Hall Jamieson and her flackcheck.org (go there and learn how you can combat false advertising on behalf of political candidates), be in awe of Eleanor Holmes Norton who has long been a hero for me. I felt genuinely fortunate to have this responsibility, and I only hope that many of you can go to convention in Texas in 2014. There will be many more battles to be won! Registration begins at 8 a.m.; Keynote speaker at 9:15 a.m.; Closing reception at 1 p.m.
Why: Recent scientific studies and increasing anecdotal evidence point to dire human health impacts from both gas drilling operations and mountaintop removal coal mining. This conference seeks to highlight the findings of scientists and health professionals and the experiences of medically-impacted residents so that the general public can be better informed and involved. Will we face an impending health crisis in much of our region, or will citizen action ensure a healthier future? Dr. Wilma Subra, environmental scientist. Subra has degrees in microbiology, chemistry and computer sciences. She served as vice-chair of the EPA National Advisory Council for Environmental Policy and Technology and is president of the Subra Company. She appears in the 2010 documentary Gasland. Subra is available for phone interviews with reporters on Tuesday, September 4 at 337-367-2216. West Virginia’s Division of Energy is in the midst of updating the state’s 5-year energy plan. The agency is asking for public comment. 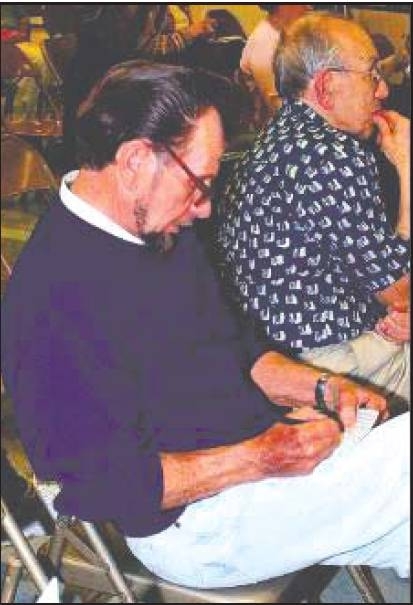 September 7: in the Foxcroft Ballroom of the Martinsburg Holiday Inn.